I stare at the directions wondering if this is a huge waste of time. Maybe I should just go to bed. Everyone else is already asleep. I look down at the milk that’s beginning to steam in my favorite saucepan. There is no turning back now. Slowly heat the milk to 180 degrees F. Then bring the temp down to 110 F using a water bath. Now stir in the yogurt. The yogurt plops in and I begin to stir. I quickly realize the thick Greek yogurt I am using should have been thinned a bit with the warm milk before adding it to the whole pot. It would have blended in much better if it was a thinner consistency. I will remember that for next time. I had to think about this one for a while beforehand. I did some research online and discovered several different methods for making yogurt. All of them agree on two key concepts. don’t move, jostle or look in its direction until its done or bad things happen. I don’t have a heating pad, my oven wont maintain a temp that low (110F) and I would rather not have to fiddle with the yogurt in the middle of the night so no crock pot either. I figure I am going to have to jerry-rig something else. I preheat the oven to 200 degrees (the lowest temp for my oven) and pour the yogurt into a sterilized quart Bell Jar. This I placed in the center of my big stockpot. I have a bunch of those rice/flax-seed muscle packs you heat in the microwave, so I tossed two of my big ones in the microwave. When they were hot I packed them around the jar in the pot. Then I covered the rice packs with a towel to trap the heat around the jar, leaving the jar mouth uncovered in the center. The lid went on the stock pot and I put it in my oven with the oven turned off, but still preheated. I finally went to bed and left the yogurt to culture all night. I went straight to the kitchen and opened the oven. Off came the lid. I expected a ripe sour milk odor, but got only a slight whiff of sweet milk overpowered by the smell of hot rice. The yogurt looked, well, like yogurt. I lifted the jar and walked over to the window. With better light I could see a tiny layer of whey on the top with a thicker solid mass below. I shook the jar lightly. Yup, that’s a solid mass. I tried to push away all the rules I was taught as a kid about drinking milk that had been left out longer then four hours. “You can get sick!” I was warned. I assured myself that I pasteurized the milk and the jars, so it should be fine and plunged a spoon into the jar. The solid mass wasn’t so solid. It was actually… creamy and slightly lumpy. I stirred the yogurt well and brought the spoon to eye level. Well, here we go. I licked the spoon. Wow, less tart than I expected. Actually not really that tart at all. I pour some out into a bowl and take a larger bite. It’s really good. Far better than I expected. Thinner then most yogurt and could be thickened by draining for a few hours in cheesecloth. Actually, if I drain some overnight I could have yogurt cheese in the morning! I love yogurt cheese! I pull out the last of my cheesecloth and begin preparing for tomorrow’s yogurt cheese. Makes 1 quart of yogurt. 1 quart (4 cups) of milk, whole or 2% fat. Try not to use ultra-pasteurized milk. It doesn’t usually come out right. 1/4 cup Greek yogurt, use high quality because you are only buying it once and you want to make high quality yogurt. thermometer, not required, but extremely stress reducing. 1. Clip a cooking thermometer to a medium-sized saucepan. Slowly warm 1 quart of milk on med-low heat, stirring occasionally. 2. 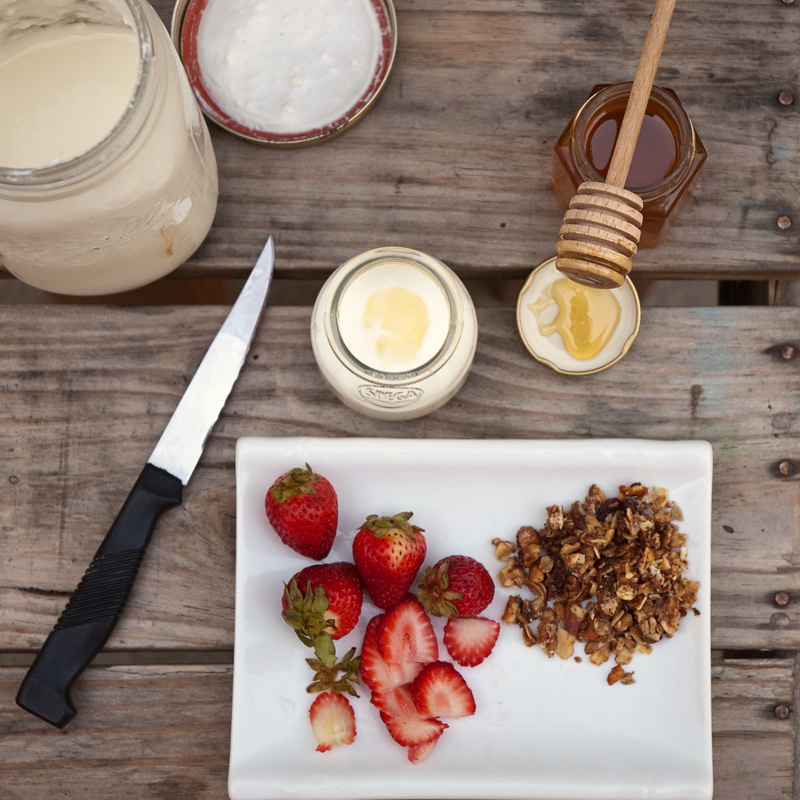 While the milk is warming, measure 1/4 cup of high quality greek yogurt into a small bowl. Set aside. 3. When the milk reaches 180 degrees F, which should take 20-30 minutes depending on your elevation, remove from the heat and set the saucepan in the cold water bath. Be careful not to get any water in the milk. Bring the temp down to 110 degrees F. Remove from the cold bath and set aside. 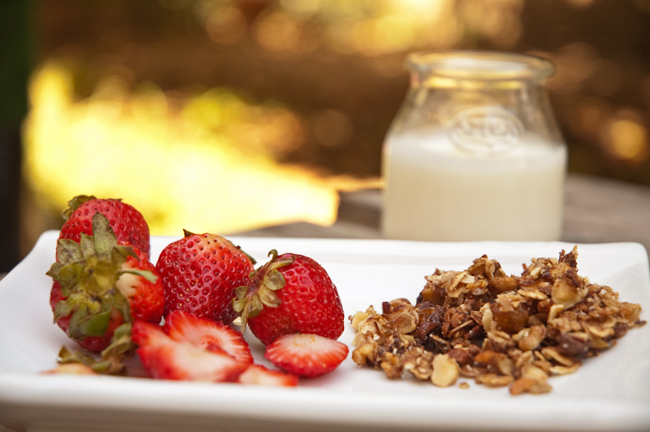 Stir a few tablespoons of warm milk into the bowl of yogurt to thin it. Then pour the yogurt into the pot of milk and stir well. 4. 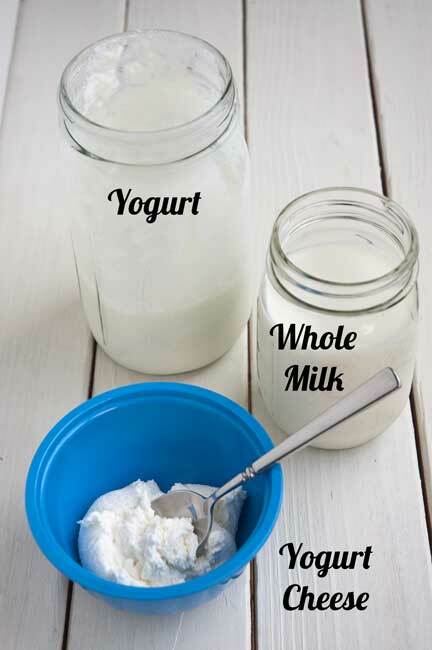 Pour milk/yogurt mixture into a clean quart sized jar. There are several ways to incubate the yogurt. I have had success with the above oven method and with the thermos method (I used a small ice chest). I leave my lids off when I use the oven method to reduce condensation in the jars, but when I use hot water in my ice chest I like to put the lids on to reduce possible contamination from the water. Both ways work fine. 5. Store in the refrigerator and use within 1-2 weeks. When you have about 1/4 cup of yogurt left make more yogurt! Use your remaining yogurt as your starter. Line a bowl with 4 layers of cheesecloth. Pour half a quart of yogurt into the cheesecloth and gather the corners at the top. Tie closed with some string and hang over a bowl in the fridge. I usually tie the string to something on the fridge shelf, like a support, and place a bowl underneath to collect the whey. After 24 hours untie the cheesecloth and remove the cheese. Place into a bowl and add a little salt. Other flavorings can be added at this time including roasted bell peppers or garlic, herbs, or just a little pepper. Serve with flat bread or chips. Use within the week. 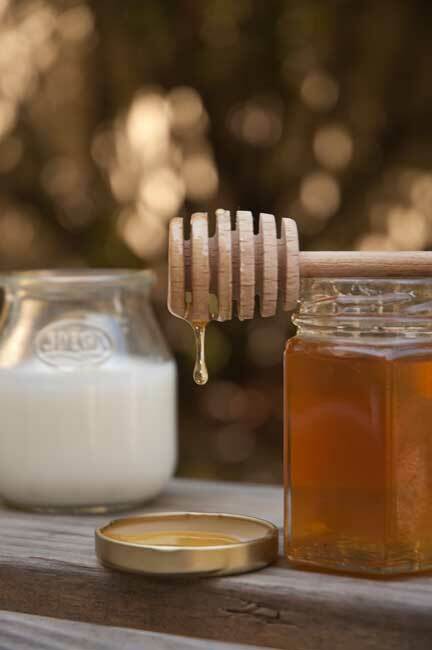 *** For those of you who are lactose intolerant, I have read that although most commercially made yogurt contains some lactose, making your own yogurt will give you virtually lactose free product. This has to do with the longer fermentation time in home yogurt making. The longer you ferment the less lactose you will have. Try fermenting for 24 hours. It’s worth a try if you miss eating yogurt. I love how you jerry-rigged up your own way to keep the temperature consistent. Looks delicions! Thanks! I jerry-rig a lot of stuff 🙂 I grew up in a rural area and you had to use what you had and make do. That’s awesome. I use to have a really old yogurt maker but I don’t have it any more and I’ve been missing making my own yogurt. I had no idea about the lactose either, that is really cool and good to know! Love the pictures and love the directions and notes – really helpful since I’m thinking of making my own yogurt after using a yogurt maker with premixes for some time now! I thought about buying a yogurt maker but its so easy to make on your own. You should try it! I have been making yogurt for years and all I do is take a 4-cup measuring cup, fill it with water and microwave it for 5 to 10 minutes. Place my yogurt-to-be mix in the microwave with the quart of hot water and close the door. Works like a charm. It often provides me with yogurt within two hours. Also, if you add a cup of powdered milk to the above recipe you will get a much thicker yogurt. I read about an experiment involving yogurt and how long it could be left out before spoiling. It was darn near days! I am sure you can find the info on the web. The yogurt gets a bit more sour tasting is all which it will do also if you keep using your leftover yogurt for a starter.